Lucky Emperor Casino seems to be stuck in the past century. However, we can’t judge the casino only by its website design. Read our Lucky Emperor review to see whether this place is worth your attention or not. Supports 4 currencies and 2 language options. Provides newcomers with a tiny Welcome Bonus which carries pretty high wagering requirements. As we have already mentioned, Lucky Emperor Casino is powered by a single provider - Microgaming. Despite this fact, they still managed to fill up their game library with over 500 game titles. These don’t include any live casino games, so if you prefer playing interactive games, you will have to find them somewhere else. What’s even more disappointing, the casino doesn’t have a mobile version of the website. So, you can play their games only on your desktop using a downloadable version or an instant-play lobby. If anything, their game lobby looks outdated in both cases. The thing Lucky Emperor Casino can be proud of is their support service. The point is, the casino offers three methods of getting in touch with their support agents: sending an email, starting a live chat, and using a callback function. All these options are available round-the-clock, so don’t hesitate to ask for help if something happens. The banking system is also not bad. You can use dozens of different banking options to make a deposit. You can choose from credit cards, Maestro, Skrill, Neteller, EcoPayz, Paysafecard, PayPal, Bank Wire, and others. Most of these options are available for withdrawals as well. The only bad thing here is that the Lucky Emperor withdrawal time is rather long - around 4 days. As a new player, you will get a tiny 100% match reward on your first deposit up to €100. That’s it! You won’t get any reload bonuses, cash-backs, Lucky Emperor free spins, or something like that. Don’t even try to search for the Lucky Emperor bonus code. The bonus terms are also straightforward - you have to wager the bonus amount no less than 60 times. Well, that’s pretty much everything we can say about their bonuses. 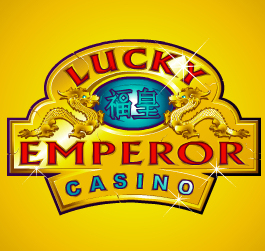 Al in all, Lucky Emperor Casino is a Microgaming-powered casino with a reliable support service, decent selection of banking options, useless first deposit bonus, outdated website, no mobile casino, and no live games. We bet you can find much better casinos on the web.